This romantic save the date card features natural bloom and rustic twigs on a charcoal background. The back of the card features simple stripes in coordinating colors. Like this save the date card? You can personalize it with your own wording and details at elli. 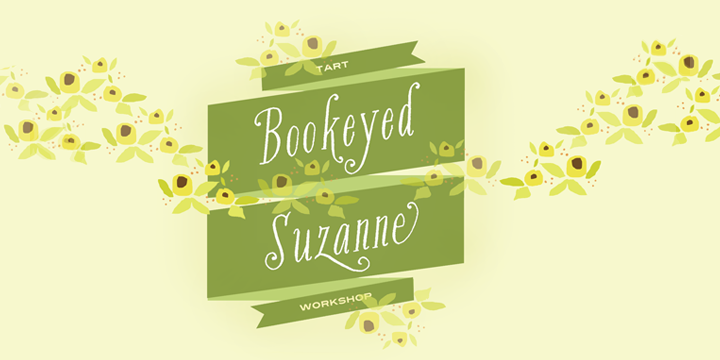 Bookeyed Suzanne is a hand-drawn design from Tart Workshop. Featuring stylish serifs created with antique French nibs dipped in walnut ink and with a large number of alternate glyphs and ligatures, Bookeyed Suzanne is a flexible vintage script typeface that can be used for various settings such as children’s books, posters, stationery, wedding invitations etc. You can buy and download Bookeyed Suzanne at Myfonts.